On the planet Telos, an archeological expedition uncovers a hidden entrance in the side of a mountain. When a member of the expedition touches the doors, he is electrocuted. The TARDIS lands nearby, and the expedition is joined by the Doctor, Jamie and Victoria. Parry, the expeditions leader, explains that they are here to find the remains of the Cybermen, who apparently died out centuries before. The expedition is funded by Kaftan, who is accompanied by her giant manservant Toberman and her colleague Klieg. The electrical charge now dissipated, the party enters the inner chamber. They find a control panel and a large, sealed hatch. The Doctor is able to open two hidden doors in the walls, but the hatch remains sealed. Parry and Klieg continue to try and open it as Toberman slips out of the city. The remaining members of the expedition begin to explore. 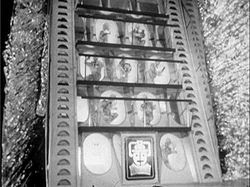 Victoria, Kaftan, and Viner, Parry's assistant, come across a chamber with a sarcophagus-like box facing a projection device that was apparently used to revitalise the Cybermen; Victoria curiously climbs inside. In the control room, the Doctor tries to convince Klieg not to activate the controls, but in pointing out Klieg's errors, he inadvertently gives Klieg the clue he needs; power is restored and the lights in the base come up. Kaftan, taking advantage of the restored power, secretly seals Victoria in the sarcophagus. Kaftan tries to activate the projector pointing at the sarcophagus, but the Doctor arrives and frees Victoria. Meanwhile, Haydon and Jamie have been experimenting with a control panel in another room; before the Doctor can intervene, a Cyberman slides into view and a gun fires, killing Haydon. Everyone is convinced Haydon was killed by the Cyberman, but the Doctor points out that Haydon was shot in the back. Throwing the switches again, the Cyberman - in reality an empty shell - is destroyed by the gun, which emerges from a hidden panel, showing that the room is actually a testing range. Victoria finds a small silver caterpillar-like object on the floor, which the Doctor identifies as a cybermat. Once his back is turned, she places it in her handbag. Outside, Toberman reports to Kaftan that, "It is done." Captain Hopper, the expedition's pilot, returns and angrily reveals that someone has sabotaged the rocket ship — they cannot leave the planet until repairs are made. Klieg believes he has found the logical sequence to open the hatch, but fails again; the Doctor surreptitiously presses a button and the hatch opens. Leaving Kaftan and Victoria behind, the others descend the hatch. They find a vast chamber beneath, with a multistorey structure containing cells of frozen Cybermen, entombed in suspended animation. In the control room, Kaftan drugs Victoria's coffee and shuts the hatch. Klieg activates more controls in the tomb and the ice begins to melt. Klieg shoots Viner when the latter tries to stop him, and holds the rest at bay while they watch the Cybermen return to life. Klieg reveals his real agenda: he and Kaftan belong to the Brotherhood of Logicians, who possess great intelligence but no physical power. He is certain the Cybermen will be grateful for their revival and ally themselves with him. Victoria awakes, notices the sealed hatch and confronts Kaftan, who threatens to shoot her if she tries opening it. The cybermat revives and attacks Kaftan, rendering her unconscious. Victoria grabs Kaftan's pistol and shoots the cybermat. Not knowing which lever opens the hatch, she leaves the city to find Hopper. Down in the tombs, the Cybermen free their leader, the Cyberman Controller, from his cell. When Klieg steps forward to take the credit for reviving them, the Cybercontroller grabs and crushes his hand, forcing him to his knees and declaring, "You belong to us. You shall be like us." The Doctor realises that the tombs were an elaborate trap: the Cybermen were waiting for beings intelligent enough to decipher the controls needed to free them. The expedition will be converted into Cybermen in preparation for a new invasion of Earth. Jamie tries to escape and manages to elude a pursuing Cyberman for a time but is eventually captured along with all the others trapped in the inner chamber. The Cybermen tell Klieg that he will be the first of the new race of Cybermen, but he will be altered to remove his capability to feel fear. In the control room, Hopper and Callum have figured out how to open the hatch. Hopper descends into the tombs, and uses smoke grenades to distract the Cybermen while the humans make their escape - all but Klieg and Toberman. Klieg eventually makes it to the hatch and knocks, and the others let him through, since the Doctor points out that he is more dangerous left down with the Cybermen than he would be under their watch. Toberman is left behind. Klieg and Kaftan are moved into the testing range to keep them out of mischief while the others decide on their next course of action. Klieg prises a weapon out of the hands of the Cyberman target, an X-ray laser he calls a cybergun. Klieg and Kaftan decide to use the gun to convince the Cybermen to do their bidding under threat of being forced back into their tomb and frozen. In the control room, the expedition is threatened by cybermats released by the Cybermen below. The Doctor manages to rig electrical cables from the control panel to create a magnetic field that disables the cybermats. Klieg and Kaftan step out armed with the cybergun, which Klieg fires. Klieg hits Callum in the shoulder. He opens the hatch and calls for the Cyberman Controller. The Controller climbs up, accompanied by Toberman, who has been partially cyberconverted and is under Cyberman control. The Controller moves slowly, as his energy is running low — most of the Cybermen have been ordered back to their tombs to conserve power. Holding the cybergun on the Controller, Klieg says he will allow it to be revitalised if the Cybermen help him conquer the Earth. The Controller agrees. The Doctor helps the Controller into the sarcophagus in an attempt to trap it there, but the revitalised Controller is too strong and breaks free. Toberman knocks Klieg unconscious. The Controller picks up Klieg's cybergun and kills Kaftan when she tries to block its return to the tombs. The death of Kaftan and the urging of the Doctor shake Toberman out of his controlled state. He struggles with the Controller and hurls it into a control panel, apparently killing it. The Doctor wants to make sure the Cybermen are no longer a threat, and goes back down into the tombs with Toberman. Klieg regains consciousness and sneaks down with the cybergun. He keeps the cybergun trained on the men while he revives the Cybermen once again. Jamie follows them down but gets discovered by Klieg. Klieg intends to turn the three over to the Cybermen, whom he expects to control now that the Controller is dead, but a revived Cyberman throttles Klieg from behind and kills him. Toberman fights and kills this Cyberman, while the Doctor and Jamie freeze the others in their cells. The Doctor, Jamie and Toberman return to the control room. Hopper's crew have repaired the ship, and the Doctor ensures that the controls make less sense than the logical order the Cybermen had set up. He then ushers all except for Jamie out as he sets up a circuit to electrify the doors again along with the control panels, to prevent anyone from entering the city. The Controller, still alive, lurches forward. Everyone tries to shut the outer doors, but the Controller is too strong. Toberman comes forward, pushes the others aside and uses his bare hands to shut the doors. He succeeds, completing the circuit, and both he and the Controller are electrocuted and killed. The expedition members say good-bye to the Doctor and his companions and return to their ship. Jamie asks the Doctor if this is the end of the Cybermen, and the Doctor says it is, but adds that he does not like to make predictions. As they return to the TARDIS, no one notices a lone cybermat, moving along the ground outside the doors to the city toward Toberman's body.